A Corporate Controller is responsible for directing and supervising the accounting and finance department functions. The primary responsibilities listed on the Corporate Controller Resume include the following – supervising monthly close process, providing annual billing to clients, billing client’s reimbursements, collecting accounts receivable, supervising accounts payable, preparing annual budget, assisting in preparation of tax projection, creating and implementing procedures to detect and resolve all accounting issues; supervising the payroll billing and asset management, coordinating and recording all investments made in securities and funds; and assisting the Chief accounting officer. 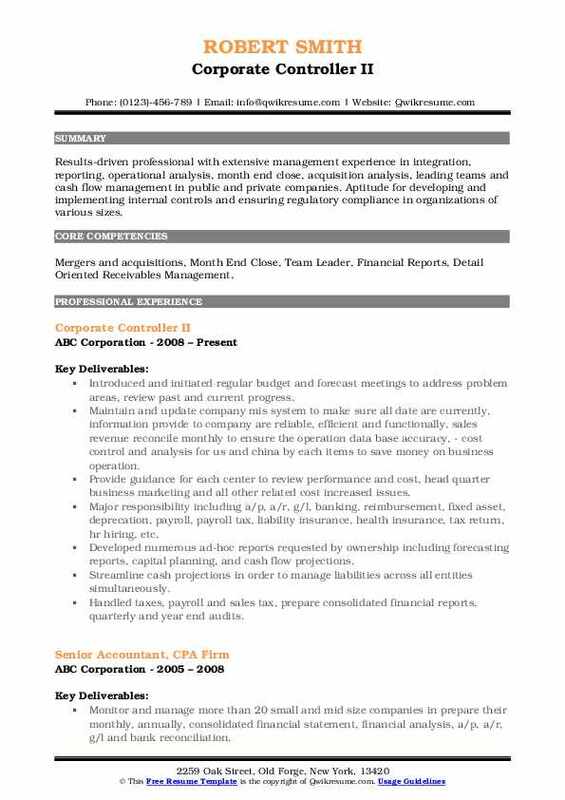 A well-drafted resume emphasizes on the following – a clear understanding of CPA ethical standards, knowledge of GAAP and financial reporting; exceptional computer skills mainly in operating all programs used by the company and the ability to summarize and articulate complex legal financial information. A Master’s degree with an emphasis on accounting is preferred. CPA will enhance job prospects. 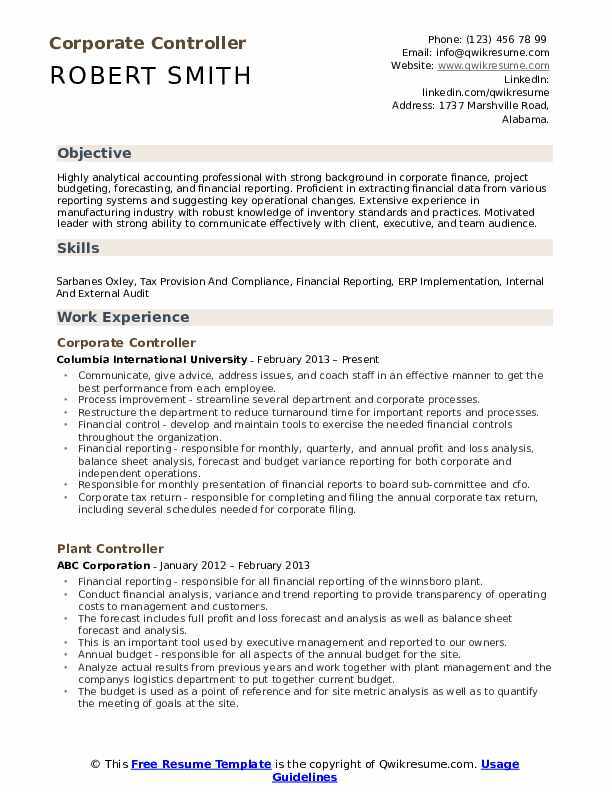 Headline : Highly analytical accounting professional with strong background in corporate finance, project budgeting, forecasting, and financial reporting. 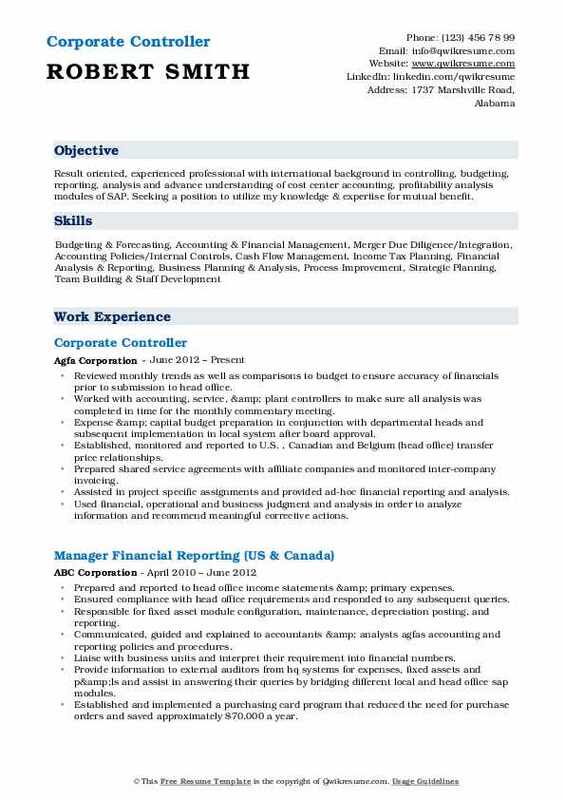 Proficient in extracting financial data from various reporting systems and suggesting key operational changes. Extensive experience in manufacturing industry with robust knowledge of inventory standards and practices. Motivated leader with strong ability to communicate effectively with client, executive, and team audience. Communicate, give advice, address issues, and coach staff in an effective manner to get the best performance from each employee. Process improvement - streamline several department and corporate processes. Restructure the department to reduce turnaround time for important reports and processes. Financial control - develop and maintain tools to exercise the needed financial controls throughout the organization. Financial reporting - responsible for monthly, quarterly, and annual profit and loss analysis, balance sheet analysis, forecast and budget variance reporting for both corporate and independent operations. Responsible for monthly presentation of financial reports to board sub-committee and cfo. Corporate tax return - responsible for completing and filing the annual corporate tax return, including several schedules needed for corporate filing. Annual budget - lead annual budget preparation setting a clear plan and deadlines that all departments can follow. Analysis of actual results, previous budgets, and new budget identifying areas of possible improvement for the cfo. Objective : Uniquely versatile, results-driven, hands-on Controller with exceptional management skills and a passionate dedication to Finance and Accounting as drivers of business goals and success. Track record of realizing bottom-line savings, enhancing profitability and viability by partnering and understanding organizational needs. Comprehensive understanding of financial operations, with hands-on experience in areas including financial analysis and planning, tax preparation and cash management. Direct all financial programs and policies for $5m connectivity software company. Perform timely financial analysis and planning for budgets, cash flow and operating results. Defined, benchmarked, implemented and managed budgets for p&l, sales and cash. Established human resources policies and procedures, ensuring compliance with federal and state employment regulations, protecting company from liability, and facilitating positive employee relations. Generated cost savings and increased efficiency by improving financial policy and procedures. Established procedures to segregate duties in accounting for stronger internal security and compliance with gaap and auditing principles. Managed cash and p&l to successfully bring company through economic downturn, by reducing expenses prepared conservative and worst-case projections for sales, p&l and cash; provided recommendations for expense reduction. Negotiated american express payments, preserving corporation's and founders' good credit ratings. Planned and implemented layoffs, salary reductions, mandatory vacations, cuts in supplies and business services. Collaborated with outside cpa firm to assume scheduling and other routine tasks they had performed, thereby reducing fees. Summary : Result oriented, experienced professional with international background in controlling, budgeting, reporting, analysis and advance understanding of cost center accounting, profitability analysis modules of SAP. Seeking a position to utilize my knowledge & expertise for mutual benefit. Reviewed monthly trends as well as comparisons to budget to ensure accuracy of financials prior to submission to head office. Worked with accounting, service, & plant controllers to make sure all analysis was completed in time for the monthly commentary meeting. Expense & capital budget preparation in conjunction with departmental heads and subsequent implementation in local system after board approval. Established, monitored and reported to U.S. , Canadian and Belgium (head office) transfer price relationships. Prepared shared service agreements with affiliate companies and monitored inter-company invoicing. Assisted in project specific assignments and provided ad-hoc financial reporting and analysis. Used financial, operational and business judgment and analysis in order to analyze information and recommend meaningful corrective actions. Ensured proper cost centers and accounts were used for accurate financial reporting. Reviewed manager approvals to ensure compliance to internal control and policies. 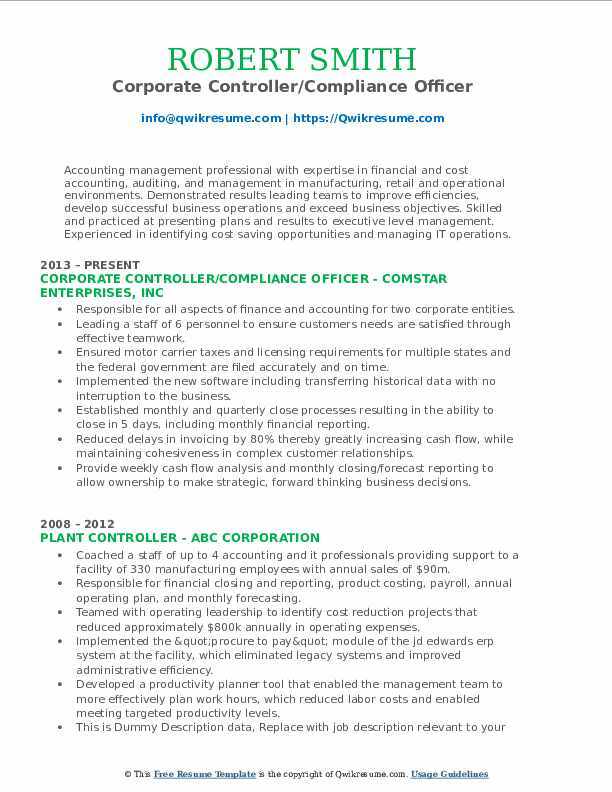 Summary : Accounting management professional with expertise in financial and cost accounting, auditing, and management in manufacturing, retail and operational environments. Demonstrated results leading teams to improve efficiencies, develop successful business operations and exceed business objectives. Skilled and practiced at presenting plans and results to executive level management. Experienced in identifying cost saving opportunities and managing IT operations. 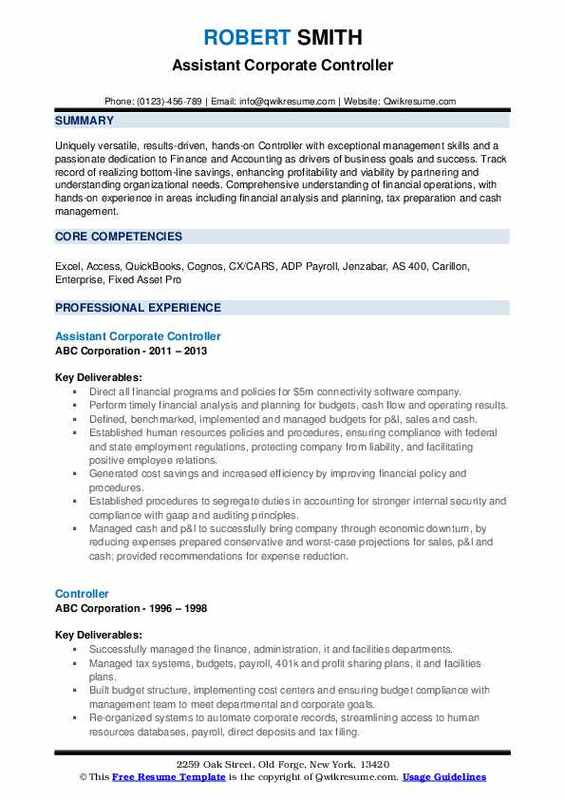 Skills : Forecasting, Reporting and Analysis, Internal Financial Controls, Budgeting, General Ledger, A/P, A/R, Cost Accounting, ERP Systems, Payroll Processing, IT Operations. Responsible for all aspects of finance and accounting for two corporate entities. Leading a staff of 6 personnel to ensure customer's needs are satisfied through effective teamwork. Ensured motor carrier taxes and licensing requirements for multiple states and the federal government are filed accurately and on time. Implemented the new software including transferring historical data with no interruption to the business. Established monthly and quarterly close processes resulting in the ability to close in 5 days, including monthly financial reporting. Reduced delays in invoicing by 80% thereby greatly increasing cash flow, while maintaining cohesiveness in complex customer relationships. Provide weekly cash flow analysis and monthly closing/forecast reporting to allow ownership to make strategic, forward thinking business decisions. Selected and implemented new expense reporting system (concur) to improve upon the expense reporting process and timely reporting of financial statements. Summary : Results-driven professional with extensive management experience in integration, reporting, operational analysis, month end close, acquisition analysis, leading teams and cash flow management in public and private companies. Aptitude for developing and implementing internal controls and ensuring regulatory compliance in organizations of various sizes. 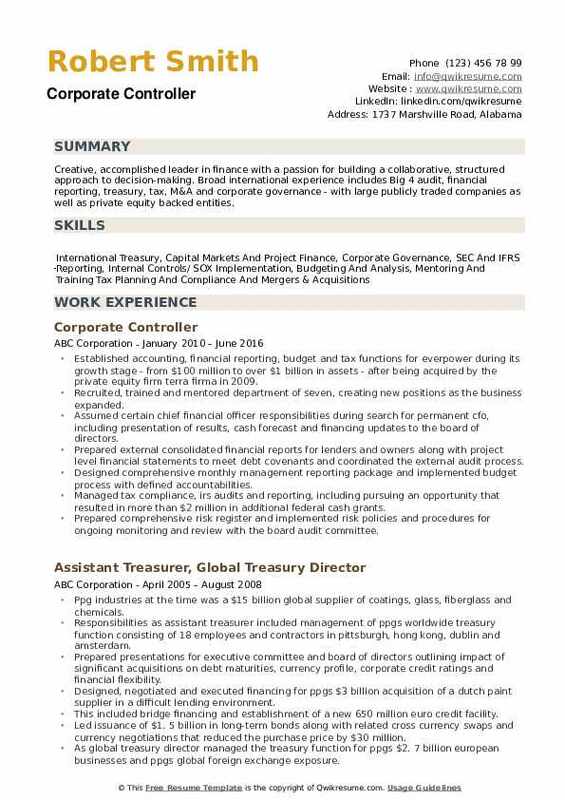 Skills : Mergers and acquisitions, Month End Close, Team Leader, Financial Reports, Detail Oriented Receivables Management. Introduced and initiated regular budget and forecast meetings to address problem areas, review past and current progress. Maintain and update company mis system to make sure all date are currently, information provide to company are reliable, efficient and functionally, sales revenue reconcile monthly to ensure the operation data base accuracy, - cost control and analysis for us and china by each items to save money on business operation. Provide guidance for each center to review performance and cost, head quarter business marketing and all other related cost increased issues. Major responsibility including: a/p, a/r, g/l, banking, reimbursement, fixed asset, deprecation, payroll, payroll tax, liability insurance, health insurance, tax return, hr hiring, etc. Developed numerous ad-hoc reports requested by ownership including forecasting reports, capital planning, and cash flow projections. Streamline cash projections in order to manage liabilities across all entities simultaneously. Handled taxes, payroll and sales tax, prepare consolidated financial reports, quarterly and year end audits. 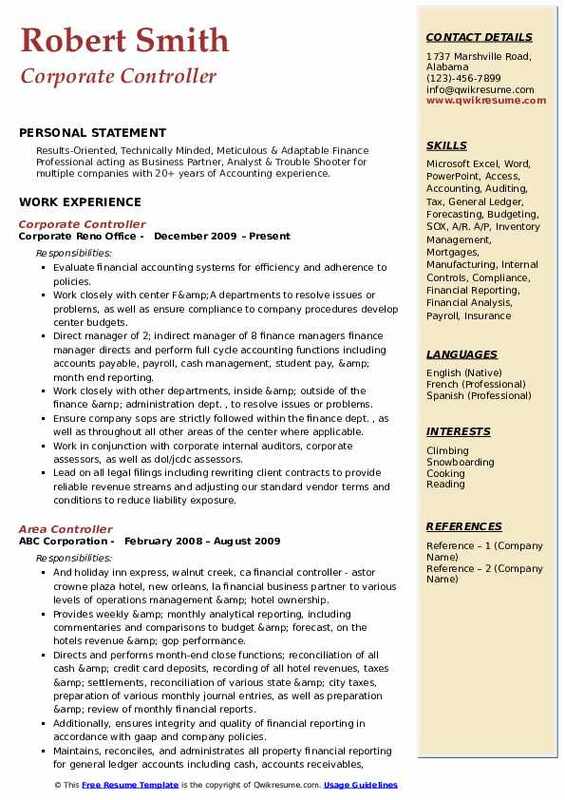 Summary : Results-Oriented, Technically Minded, Meticulous & Adaptable Finance Professional acting as Business Partner, Analyst & Trouble Shooter for multiple companies with 20+ years of Accounting experience. Evaluate financial accounting systems for efficiency and adherence to policies. Work closely with center F&A departments to resolve issues or problems, as well as ensure compliance to company procedures develop center budgets. Direct manager of 2; indirect manager of 8 finance managers finance manager: directs and perform full cycle accounting functions including accounts payable, payroll, cash management, student pay, & month end reporting. Work closely with other departments, inside & outside of the finance & administration dept. , to resolve issues or problems. Ensure company sops are strictly followed within the finance dept. , as well as throughout all other areas of the center where applicable. Work in conjunction with corporate internal auditors, corporate assessors, as well as dol/jcdc assessors. Lead on all legal filings including rewriting client contracts to provide reliable revenue streams and adjusting our standard vendor terms and conditions to reduce liability exposure. Establishing billing procedures that reduce outstanding a/r from 180+ days to maximum of 35 days. Summary : Creative, accomplished leader in finance with a passion for building a collaborative, structured approach to decision-making. Broad international experience includes Big 4 audit, financial reporting, treasury, tax, M&A and corporate governance - with large publicly traded companies as well as private equity backed entities. Established accounting, financial reporting, budget and tax functions for everpower during its growth stage - from $100 million to over $1 billion in assets - after being acquired by the private equity firm terra firma in 2009. Recruited, trained and mentored department of seven, creating new positions as the business expanded. Assumed certain chief financial officer responsibilities during search for permanent cfo, including presentation of results, cash forecast and financing updates to the board of directors. Prepared external consolidated financial reports for lenders and owners along with project level financial statements to meet debt covenants and coordinated the external audit process. Designed comprehensive monthly management reporting package and implemented budget process with defined accountabilities. Managed tax compliance, irs audits and reporting, including pursuing an opportunity that resulted in more than $2 million in additional federal cash grants. Prepared comprehensive risk register and implemented risk policies and procedures for ongoing monitoring and review with the board audit committee. Selected, designed and directed the implementation of new accounting software.